Please note that the links on this page are organised according to topic. Festivals are listed in the order they occur in during the year, starting with Purim. Purim Songs by Aish Hatorah – has transliterated lyrics and a translation for each song. Songs may be played or downloaded. Ganza Megillah – a written, detailed retelling of the story of Megillat Esther. Suitable only for older children. 60 Second Overview – a brief, written version of the story of Purim. Lego Purim – a video telling a simplified version of the story for younger children. The Story of Purim Narrated by your Neighbourhood Hamantash – a slideshow telling a good, shortish version of the story of Purim – no audio, designed for children with reading skills. Mask & Crown – an online activity allowing children to decorate a Purim mask or crown. Suitable for young children. Ma Nishtana in Yiddish by Uncle Velvel. Video of Uncle Velvel singing a Yiddish version of the Seder song,Mah Nishtanah. Suitable for those with an interest in the Yiddish language. The Story of Shavuot by Chabad.org – note: assumes that viewers can read. Writing A Torah Scroll by Chabad.ord. Note: not suitable for children under 8 years old. 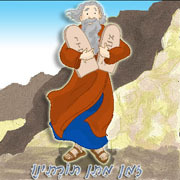 Facts About Moses by Chabad.org. Jewish Holidays – Shavuot on You Tube. Suitable to use for older children as the basis for a lesson or discussion. Shavuot on You Tube. A more detailed video suitable for older children to use as the basis for a lesson.